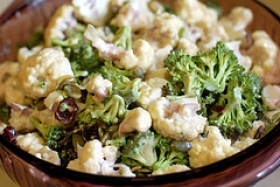 Have you made Broccoli And Cauliflower Casserole? 1. No extra salt is needed. 2. Cut broccoli in small pieces. 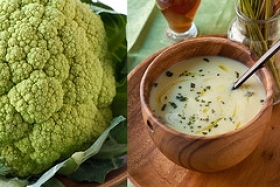 Place broccoli in boiling water; cover and reduce heat. 3. Boil for 5 minutes. 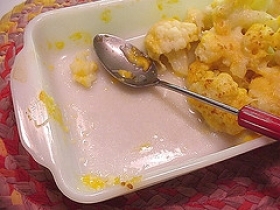 Cook cauliflower for 3 minutes. 4. Remove and drain both. Cook frozen packages as directed. 5. 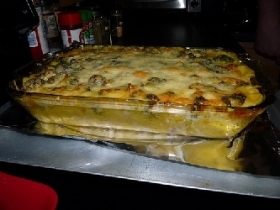 Melt 1/2 stick butter and put in a 9 x 8-inch casserole dish. 6. Grease lightly. 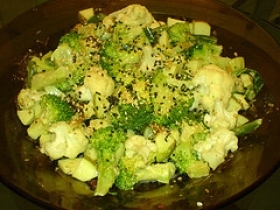 Arrange broccoli and cauliflower in layers in bottom of dish. 7. Combine eggs, soup and milk. Mix well. 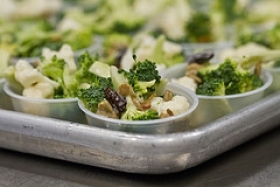 Sprinkle 1/2 cup of crumbs into broccoli and cauliflower. 8. Press crumbs into broccoli and cauliflower mixture evenly. 9. Sprinkle remaining bread crumbs into dish. Pack lightly with spatula. 10. Cook at 350 degrees for 15 minutes. 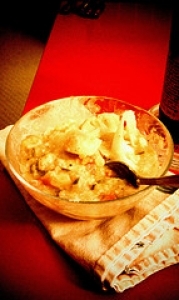 Remove from heat; place cheese on top. This recipe contains potential food allergens and will effect people with Wheat, Egg, Milk, Butter, Gluten, Cheese allergies.